Of all the acclaimed Charleston, Sc restaurants the one that gets the most press has got to be Hominy Grill, click to visit the Hominy Grill Website, located in our Elliotborough only a half a block from Chez Moi (where very little home cooking happens). 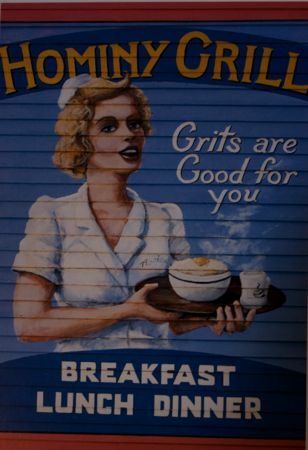 Flip through a New York Times and you might just see an article on our little neighborhood grits place, or surf over to the Food Network and check out Robert Stelling cooking something delicious (click to view food network Hominy Grill). I always order a salad and the fried green tomatoes along with several sides like fried okra and collards or the pork chop if it is on the special board. The desserts are fabulous too! On Sunday the line is halfway down the block so I go for breakfast during the week and they have a newspaper box and open up at 7:30 so it’s a quick place to grab the paper and a coffee (and maybe a granola) to start the day.